We know that video interviews can make life easier for hiring managers. Video interviews are convenient to schedule, they’re recorded and easy to review, and they provide a time-saving replacement for the phone interview. However, video interviews also impact candidate experience. Job seekers who use video interviews share in the convenience of scheduling, with the added benefit of nixing travel time. Video interviews also offer candidates a more relaxed interview experience, as they get to choose their surroundings. In a one-way video interview, candidates may even be able to rehearse answers to questions before submitting their responses. Talk about peace of mind! Candidate experience impacts a company’s ability to hire talented individuals. It also impacts a company’s brand. As a company strives to hire top talent, it is important to cultivate a positive appearance for the company as an employer. Video interviews can be one component of an overall company brand that conveys a considerate, innovative impression to potential employees. We all want to work for a company that cares about its employees. Improving candidate experience is one way for companies to show that they care (free lunch and nap breaks are also good ideas, but we can’t all be Google). 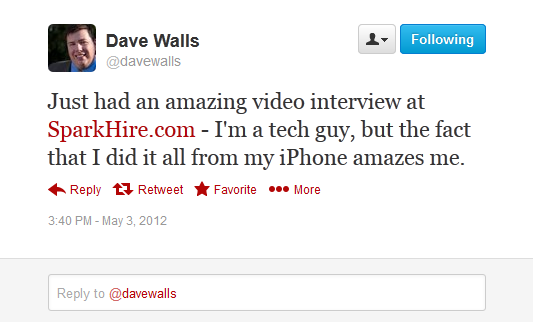 As you can see, this job seeker tweeted about his amazing experience while conducting a video interview conveniently from his iPhone. The positive experience of the video interview itself is only the beginning. Hiring managers will save time with video interviews, leading to an overall shorter hiring process (which definitely improves candidate experience!). Furthermore, better initial screenings with video interviews will help hiring managers make better decisions about candidates earlier on. Candidates will know sooner if they aren’t a good fit, and on-site interviews can be reserved for those who have the strong possibility for a job offer. How do you evaluate your candidate experience? 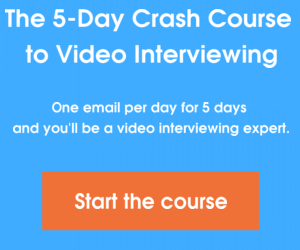 Have you had any feedback on the video interview process? Leave a comment below.